When Frank Norris died in 1902 at the age of 32 one of America's most promising literary careers was cut short. But during his tragically short career, Norris produced some of the best early twentieth century American fiction. 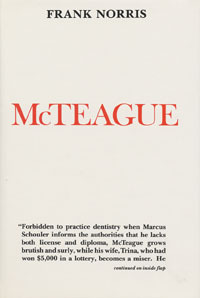 McTeague, a story of greed and ambitious social climbing, is often called Norris' best novel. Echoing Conrad in his concern with the nature of evil, and anticipating Dreiser's An American Tragedy in its financially motivated murder, Norris set the pattern for many American novels.